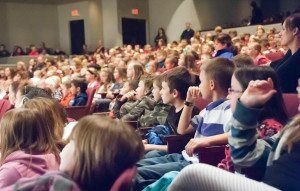 The Richmond Symphony Orchestra is proud to engage and inspire the children in this community and the surrounding region with multiple free educational opportunities for all ages. Through its two youth competitions – Orchestra Within an Orchestra and the Young Artist Competition – and three educational concerts for third, fifth, and seventh graders, the RSO will serve 3,500 children at no cost to families or schools! Thanks to the generosity of Wayne Bank & Trust, youth under the age of 18 are always encouraged to attend our subscription concerts for free! The RSO is proud to offer pre-concert conversations before each evening concert beginning at 6:30 pm in Civic Hall. These conversations offer an opportunity to meet with the conductor and the guest artist in a more intimate setting and discuss the musical presentations of the evening. Click on any of the educational programs listed below to see additional information. These ladies of First Bank can be seen outside Civic Hall directing buses and ensuring the safe arrival and departure of 3,000 children! Pictured with Monica, L–R: Teresa Jansing, Kim Poinsett, Leslie Werking and Stephanie Wright.